Summer registration is $25 and is due upon registering for classes. This fee will hold the student’s position in the classes they seek to enroll in and is non-refundable. The fee may be paid in person at the studio with check, cash or credit card. Please note: Summer session runs from June to August. Regular registration is $35 and is due upon registering for classes, throughout the year (non-Summer months). The registration fee will hold the student’s position in the classes they seek to enroll in and is non-refundable. The registration fee may be paid in person at the studio with check, cash, or credit card. Please note: Regular session runs from September to May. Registration is mandatory if you wish to participate in any classes at our dance studio. Registration for classes is available via our on-line registration form or in studio at the front desk, and must be done before your dancer begins classes. Tuition will remain the same, unless notified otherwise. If you anticipate an absence, it will be the student’s or guardian’s responsibility to notify the studio to set up makeup classes. Tuition can be paid in person at the studio. We accept checks, cash or credit card. If you are paying at the studio, please place your payment in an envelope (studio will provide an envelope). Please label your envelope with your student’s name and the classes you are paying for. Tuition is due the first week of dance classes each month. (Monday- Saturday) Tuition is late if not paid by the second week each month. If tuition is late, there is a $25 late fee added to your bill. If tuition is late by more than 30 days, additional late fees will be charged. If you are consistently late, or you tuition bill is more than two months past due, your dancer cannot attend classes until payments are made. If you pay in advance, then you leave without the 30 day notice, you will not receive a refund. Credit towards tuition will only be issued if agreed upon prior to missing days OR if you have been notified that you can have a credit towards tuition. If you notify our studio in advance of classes that will be missed, you can schedule makeup classes to fill those missed days. Makeup class must be within 30 days of missed class. Also, if you miss your makeup class, you do not get an additional makeup class. If you notify our studio that your dancer is sick, you must request a makeup day(s), otherwise you will not receive a scheduled class for those missed days. In the event that a class is cancelled due to instructor illness, and a sub is unavailable, you may schedule a makeup class within two months. It will be the student’s and or guardian’s responsibility for requesting the dates available for the makeup. A 30 day notice is required if you wish to drop a class. Otherwise, you will still be charged for this class the following month. Should a student wish to re-enroll after dropping out of a class, a reregistration fee will apply. If you remain in our studio and drop classes with a 30 day notice and have prepaid for classes, you may request that money go towards next month’s tuition. We accept vouchers from most Charter Schools. You must take care of the paperwork and any additional fees to ensure that Aria’s To The Pointe is listed or registered as a Vendor. You must notify us upon sign up that you wish to use vouchers to pay for classes. You are still responsible for competition fees, costumes fees, performance fees and any payment the voucher does not cover. We have a scholarship fund that is supported by donations, fundraisers and members of the community. If you wish to donate you may do so at the studio. We happily accept donations throughout the year. This helps to support motivated and gifted dance students throughout their training and performances. If you are interested in applying for scholarship funds, please write a letter of intent. For more information, please contact Ms. Aria aria@ariastothepointe.com. Creative Movement: Light pink leotard, pink tights, pink ballet shoes. Hair in a bun. Skirts ok.
Mommy & Me: Loose comfortable clothing. Ballet shoes or yoga socks. Hair up and out of face. Mini Jazz/Tap: Black leotard, light suntan or pink tights, black jazz shoes, black tap shoes, black shorts, hair up and out of face. Pre-Ballet: light-blue leotard, pink tights, pink waist belt, pink ballet shoes. Hair in a bun. No skirts. Ballet level 1: Forest Green leotard, pink tights, pink waist belt, pink ballet shoes. Hair in a bun. No skirts. Ballet level 2: Navy Blue leotard, pink tights, pink waist belt, pink ballet shoes. Hair in a bun. No skirts. Ballet level 3: Black leotard (navy Blue ok), pink tights, pink waist belt, pink ballet shoes. Hair in a bun. No skirts. Ballet level 4: Burgundy leotard (black leotard ok), pink tights, pink waist belt, pink ballet shoes. Hair in a bun. No skirts. 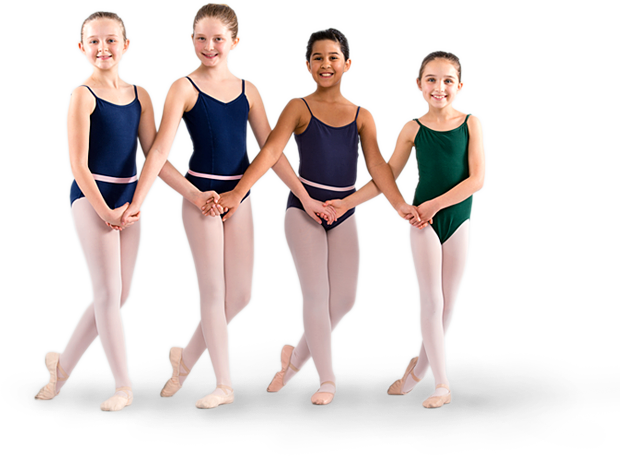 Ballet level 5 and 6: Black, Dark Purple, Navy Blue, Forest Green, or Burgundy leotard Pink tights. Pink ballet shoes. Hair in a bun. Skirts ok. Stretch and Strength: Solid color leotard, solid color tights or form fitting pants, dance shirt/sweater ok. Hair up and out of face. Please bring yoga mat and elastic band (Theraband). Adult Ballet/Jazz: Form fitting comfortable clothes. Leotard and tights encouraged but not mandatory. Ballet shoes. Hair in bun. Teen/Adult Stretch & Strength: Form fitting comfortable clothes. Leotard and tights encouraged but not mandatory. Ballet shoes or yoga socks. Please bring yoga mat and Theraband. Adult Broadway Jazz/Tap: Form fitting comfortable clothes. Leotard and tights encouraged but not mandatory. Tap shoes and ballet or jazz shoes. Hair up and out of face. Jazz: Black leotard with matching black jazz pants or shorts. Black or tan jazz shoes. Hair up and out of the face. Lyrical: Solid color leotard, solid color tights, shorts or leggings, lyrical shoes or ballet shoes, hair up and out of face. Skirts ok.
Broadway: Black or solid color leotard with matching jazz pants or shorts. Black jazz shoes. Tap shoes may be used at the request of instructor. Hair up and out of the face. Male Dancers: White t-shirt, white tight socks, white or black ballet shoes with black shorts or tights. Dancers should arrive early to be prepared for class. Ballet dancers must have a hair in nice tight bun at all times. Ballet warmups (sweaters, leg-warmers, shorts etc.) may be worn for plie’s only. For the safety of everyone, no dangling earrings or jewelry of any kind. No talking during class unless instructor gives permission to do so. This is disrespectful. If your dancer is asked several times to stop talking and does not, he or she will be asked to leave for the remainder of the class. No makeup class will be permitted. No street shoes are allowed in dance floor area at any time. No drinks, food or chewing gum is allowed in the dance area. Dancers who are late may enter the class in between a combination and ask the instructor for permission to join the class. If you are more than fifteen minutes late, you will be asked to schedule a makeup class. This disrupts the teacher and the dancers in class. Missing a large portion of a warm up can lead to injury. No food is allowed in the dance studio. Please eat snacks outside. Only water is allowed in the studio. Please talk quietly, if you cannot do so, you will be asked to step outside. Do not disturb the class in session. Only the teachers and permitted assistants are allowed in the classroom. Please do not move the furniture to stand on chairs or tables to view the class in session. We encourage timely arrival early enough to warmup and prepare for class. However, please do not drop off your child more than 15 minutes prior to class or opening of the studio. Please do not arrive late to pick up your child one class has finished, especially if the studio is closing. If you are consisting late picking up your child, additional fees will be charged of 15$ for every 15 minutes after class has ended. I will decide the appropriate level for your student; this placement is based on technique, stamina, flexibility, work ethic, and ability to pick up combinations. If you wish to discuss the progress of your students, please schedule a meeting. For safety reasons, I will decide when a dancer will be placed en pointe, and not all students will be ready for pointe work at the same age or level. The instructors will use a hands-on technique to make sure the student knows where the placement of the body needs to be. Stretching is an important part of dance and it’s encouraged to do so at home and during our scheduled Stretch & Strength classes. Students preparing for pointe must be enrolled in pre-pointe (by placement only) and take an additional 3 days of ballet technique classes per week. This is for strength and safety purposes; to build the correct muscles, placement and technical foundation needed for pointe work. Use of elastic band (Theraband) is a necessity for all students preparing for pointe work. They are available for purchase at the front desk. If only a couple of students show up to class, I reserve the right to make the class time slightly shorter. I require a minimum of four students in each class. I reserve the right to cancel the class due to low enrollment. You will have the option to move to different day, if this is to occur. Alternatively, they will be placed on a wait-list if preferred. Dance school Team Jackets are required if you wish to participate in competitions. If you wish to participate in Competitions or Dance Company, you must take a minimum of two ballet classes per week. It is my sole discretion what choreography and costumes are to be used is used for the competition dances. This applies to all groups and solos. If you feel your student needs extra one-on-one instruction, please inquire about a private lesson.